This season, there has been much concern about the cold and especially the flu. Protect yourself the best that you can by keeping your home clean and washing up after you are in high traffic areas. 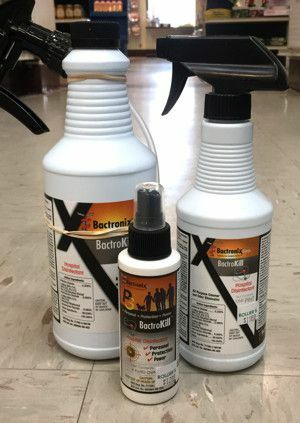 One product that can help you greatly in this task is BactroKill from the Bactronix company. This company is based right here in Pittsburgh, and has been specializing in home, office, and hospital sanitation measures for years. Just a few years ago, they started to package a product that kills and destroys many viruses and bacteria with just a simple spray. This product is called BactroKill and it has been trending this winter, for obvious reason. BactroKill uses a non-toxic nanotechnology that will kill viruses, bacteria, mold, mildew, and even superbugs! It is a great way to treat surfaces of your home that are frequently contacted and it is a great product to take with you when you run errands, go to work, or especially so when you travel! Simply spray BactroKill on any surface and let it sit for 60 seconds or more before wiping it clean. It kills 99.999% of germs just that fast! It is a more effective substitute to many of your household chemicals with out some of the potentially harmful side effects. It is great for households that have children or anyone with a compromised immune system. We love to recommend it for travel, but it is tremendously popular during the winter to combat with cold and flu season. BactroKill is available in 3oz, 16oz and 32oz bottles in our Housewares Department year-round.